The star of the Grabber family was developed for fast and strong-horsepower SUV/4x4 vehicles. With rim sizes up to 24 inches and at speeds of up to 270 km/h, this tyre not only looks good, it also provides a top performance in its segment! With its highly developed tread and the very good quality, this tyre offers safe handling in on- and light off-road terrain. Get into the Grabber World! The guarantee for safe performance. The new tread pattern is characterised by steep, extended grooves from shoulder to centre and siped sturdy tread lugs. The design, in combination with advanced silica tread compounds and a reinforced construction, makes the UHP tyre comfortable, durable and extremely safe in both wet and dry conditions. 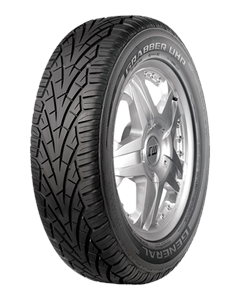 Sorry, we currently do not have any tyres with the Grabber UHP pattern in stock.